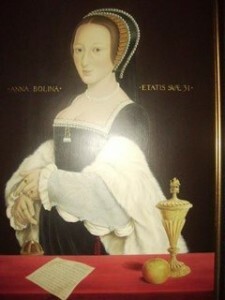 This is Part 14 of Esther Hyams’ series of poems on the life of Anne Boleyn. At Calais, Henry stayed in the Exchequer building with the Lady Marquess. Next would occur a mysterious moment of history, that none could forget. The King of England and The Lady Marquess Anne Boleyn released of fears. Was it a success? Did the earth move and the heavens sing from above? Did Anne Boleyn on that night, lose her long prized virginity to him? But it is likely that Anne finally became Henry’s lover, beyond that door. She was a pregnant woman who by January 1533 hoped as such, with fears mild. So there was much rush, as soon as possible Anne must be made the Kings wife. For inside Anne Boleyn might be a long awaited son and England’s heir. On about St Paul’s Day: 25th January 1533, King Henry and Anne were married at last. Click here to read the next poem, “Revelations”.